America’s big cities continue to outpace the overall nation in population growth and Atlanta is no slouch. Several months ago the US Census Bureau released official 2013 population estimates for counties, which generally suggested that people are moving into more urban areas. That really wasn’t too much of a surprise since more and more people having been moving into metropolitan areas over the past several decades. Well more recently the Bureau finally released it’s official 2013 population estimates for incorporated areas; meaning actual cities, not counties or metropolitan areas. The numbers show steady growth in our largest cities, reflecting our more informal understanding of the rapid urban renaissance that’s occurred over the past 5 years. While the country as a whole grew at a rate of 2.4% between 2010 and 2013, the largest cities saw rates three to five times that number. For example, Austin, Texas grew an astounding 12% in that time period far outpacing the next city above 500,000 people, Charlotte, which grew at a rate of 8.4%. Rounding out the top 5 in growth for cities above 500,000 is Denver (8.2%), Washington (7.4%), and Seattle (7.2%). While a lot of the growth was seen in the more sprawled cities of the South and West, the large dense cities of America also saw growth well above that of the country as a whole. Washington, Seattle, Boston, and San Francisco all saw growth exceed 4%, while New York posted a solid figure of 2.8%. Let’s take a look at the numbers regionally. Atlanta is not considered a “large city” by the Bureau since it has less than 500,000 people so it wasn’t included in the recently released official report. However, the numbers have still been tabulated and can be found at Census.gov. The City of Atlanta grew from 420,279 in 2010 to 447,841 in 2013, which is a rate of 6.6%. This is below Charlotte (8.4%), but above both Nashville (5.5%) and Houston (4.6%). When talking about the population of the City of Atlanta, we need to remember the “counting scandal” of the late 2000’s, which resulted in an inflated population figure for the city during the 2000’s. Once the Bureau became aware of this and corrected it, the population number took a steep dive. So if you’re looking at the number’s in the late 2000’s remember they’re likely quite inaccurate. Atlanta is keeping pace with the cities of America and also doing quite well compared to other local jurisdictions. Generally the core area is growing at rates above the national average with only Fulton County and Forsyth County surpassing the City of Atlanta. It should be noted that county population numbers include the cities that lie within them. 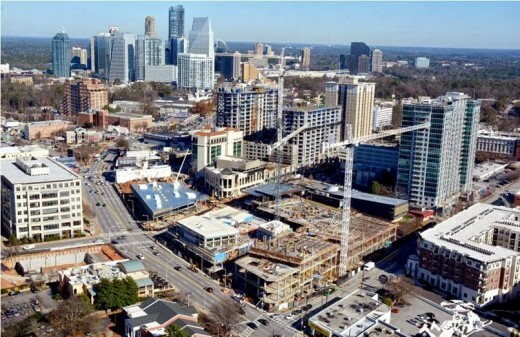 Sandy Springs, Marietta, and Gainseville all posted growth rates above 4.5% and Fulton County is well on its way toward becoming the first area jurisdiction to surpass 1 million people. The Census report looking at population trends in incorporated areas in America is stocked full of great information and is a pretty quick read. The South, interestingly, has the second most incorporated places of any region in the country with 6,576 and has a greater percentage of people living in incorporated places than the Northeast (54.7% compared to 51.3%). This is partially due to the prevalence of towns in the Northeast, which are not counted as incorporated areas, but the South still boasts the largest number of people living in cities than any other region in the US. There’s also some great information on density and land use patterns that could make for some great future conversation.